Epilepsy is the most common neurological condition in children. The most common cause of drug resistant focal epilepsy in children are malformations of cortical development (MCD). In these conditions alterations to the processes of cell migration and differentiation early in life lead to cortical areas that have aberrant cell types and layering structure. MRI is the principal imaging modality to detect these abnormalities, and it is effective when they are extensive or involve strong changes in MRI image contrast compared to healthy cortex. We have been developing high quality quantitative structural MRI to allow more optimal non-invasive lesion detection and phenotyping. However detection of abnormalities remains challenging in a significant proportion of patients. This may be attributable to the current resolution of MRI (typically ~1mm) being unable to resolve cortical structure (4-6 layers within 2-4mm). 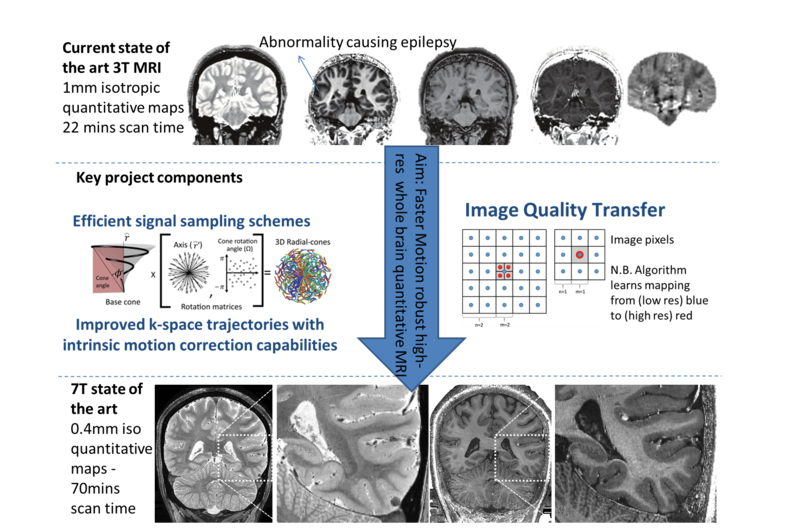 In this project, image resolution in MRI will be increased using longer scan times enabled by: utilising a new high-field 7T MRI, improved image acquisition and reconstruction that obtains more information in the same time; deep learning, computer algorithms that learn how to make high resolution images from limited data. This will enable us to provide preliminary evidence both of the feasibility of imaging at this increased resolution and the potential advantages of imaging this patient group at 7T, the new frontier of MRI for clinical application. We will obtain pilot data in patients with focal epilepsy with localising electro-clinical features that are consistent with MCD but that have no visible abnormalities in current clinical 3T MR images.